Post-it Pop-up Note Dispensers are always there when you need to capture great ideas. 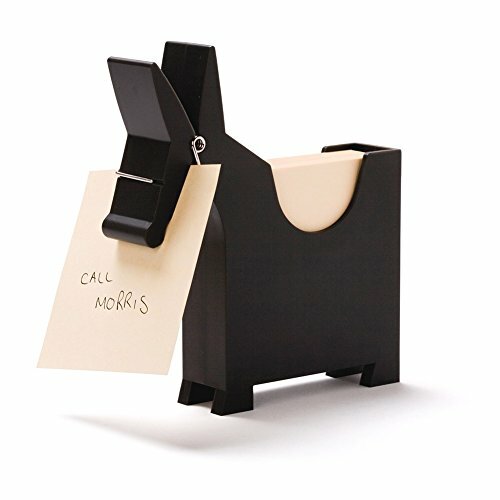 This dispenser allows you to organize your desk and always have a note nearby. Pack also includes one pad of accordion-style Post-it Pop-up Notes. For refills look for the accordion icon on all packages of Post-it Pop-up Notes. Post-it Pop-up Note Dispensers are always there when you need to capture great ideas. 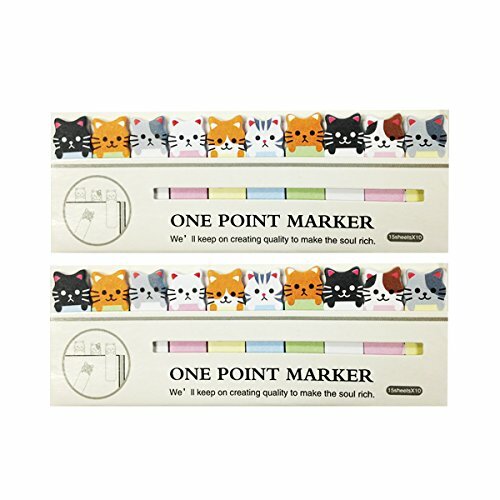 This fun white cat-shaped dispenser holds 3 in x 3 in Post-it Pop-up Notes. Help increase your productivity with a little fun! With the weighted dispenser, notes are always where you need them. For refills, look for the accordion shaped icon on all packages of Post-it Pop-up Notes. Pack includes a 45 sheet pad of bright pink pop-up notes. 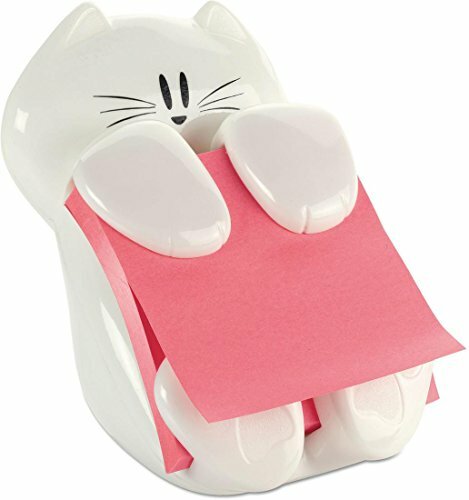 Keep Post-it Notes within reach, with this cute cat-shaped dispenser. White dispenser comes with one 3 in x 3 in pad of Pop-up Notes (Mixed case - Poppy, Limeade, Neon Orange). A fun way to keep notes at your fingertips! Half of the strip with adhesive rather than the whole one. Recommended ballpoint pen and straight-type ballpoint pen. The index tabs made of PET material, it can't absorb pen water as quickly as common paper. In case the words blurring, please do not touch them after write. Post-it Super Sticky Full Adhesive Notes lay flat longer to keep your message neat. Use for notes or reminders on doors, windows or walls. Note has full adhesive back and features a rounded edge so you can peel a note from your pad with ease. Unique adhesive reliably sticks and re-sticks so your message can stay front and center. Move your notes with you throughout the day. Bora Bora Collection brings a refreshing palette that feels like an escape to paradise. Pad sticks in a notebook or on a laptop, so you always have a note at the ready. 8 Pads/Pack, 25 Sheets/Pad. Post-it Pop-up Note Dispensers are always there when you need to capture great ideas. This combination Post-it Notes and Post-it Flags dispenser allows you to organize your desk and save space. Pack also includes one pad of accordion-style Post-it Pop-up Notes and two packs of Post-it Flags to help you get organized. For refills look for the accordion icon on all packages of Post-it Pop-up Notes. Post-it Pop-up Note Dispensers are always there when you need to capture great ideas. 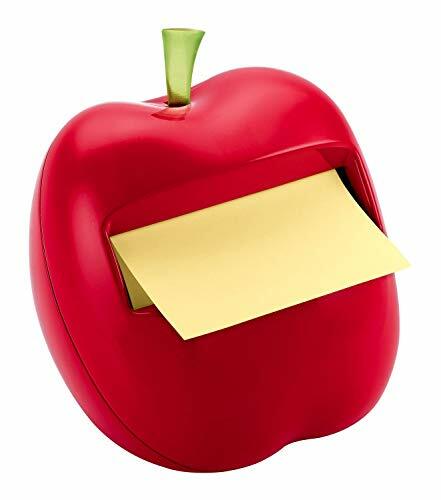 This attention getting apple-shaped dispenser holds 3 in x 3 in Post-it Pop-up Notes. Help increase your productivity with a little fun! With the weighted dispenser, notes are always where you need them. For refills, look for the accordion shaped icon on all packages of Post-it Pop-up Notes. Pack includes a 50-sheet pad of Canary Yellow pop-up notes. 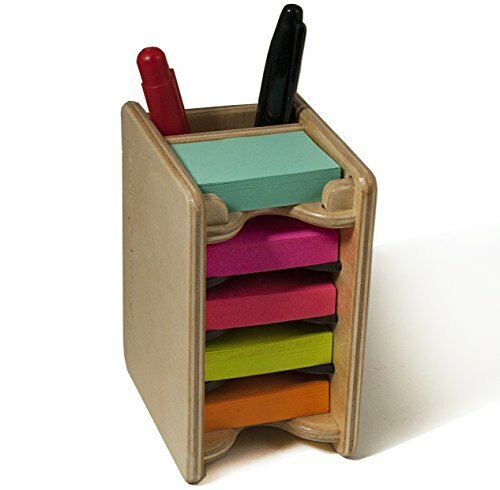 This nicely designed wooden box will help you keep your 3x3 colored sticky notes in one place on your desk or near the places you most often write your notes. INCLUDES: wooden organizer + 5 assorted colored pads (3x3 ; 70 notes/pad; assorted colors will vary. See our other listings for a no-pad option) A pen/marker holder allows you to always find that otherwise elusive pen that you quickly need to write your notes. Moreover, the upper shelve is designed to keep an active sticky note pad to directly write on. Sturdy and well crafted in birch wood. Measures : Width 3.6" x Depth 5" x Height 4.4". Please check our store for other sizes of sticky notes holders (click on Strictly Origamic link above/below the product title or type amazon.com/strictlyorigamic in the address bar). Made in USA. 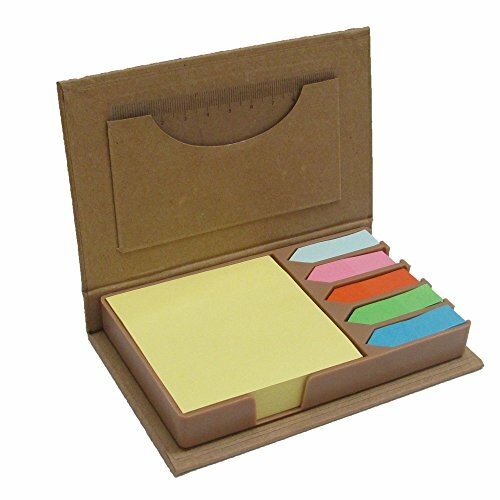 This nicely designed wooden box will help you keep your 3x3 colored sticky notes in one place on your desk or near the places you most often write your notes. A pen/marker holder allows you to always find that otherwise elusive pen that you quickly need to write your notes. Please check our store for other sizes of sticky notes holders (click on Strictly Origamic link above/below the product title or type amazon.com/strictlyorigamic in the address bar). Made in USA. Morris stores your blank notes until you need them. He can also display your memo's so they don't get missed or forgotten. 140 white paper notes includes. Keeps your pen handy and displays your memo's so they don't get missed or forgotten. For those that like mini sticky notes (1.5 x 2 in. 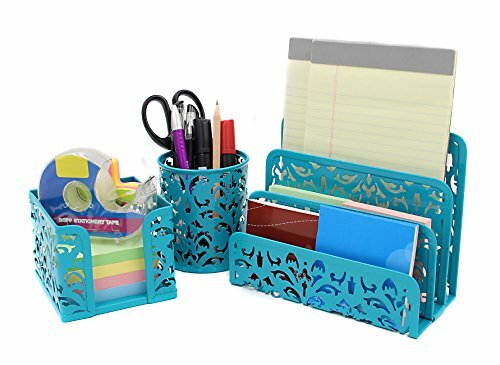 ), this organizer is perfect for keeping the sticky notes organized and in one place. INCLUDES: wooden organizer + 5 assorted colored pads (1.5 x 2 in ; 100 notes/pad; assorted colors will vary). A pen/marker holder allows you to always find that otherwise elusive pen that you quickly need to write your notes. Sturdy and well-crafted in birch wood. Measures: Width 2.5" x Depth 3.5" x Height 4.4". Please check our other Strictly Origamic listings for other sizes of sticky notes holders. Made in USA. For those that like mini sticky notes (1.5 x 2 in. ), this organizer is perfect for keeping the sticky notes organized and in one place. INCLUDES: wooden organizer + 5 assorted colored pads (1.5 x 2 in ; 100 notes/pad; assorted colors will vary). Please visit our Strictly Origamic store for other sizes of sticky notes holders. (click on Strictly Origamic link above/below the product title). 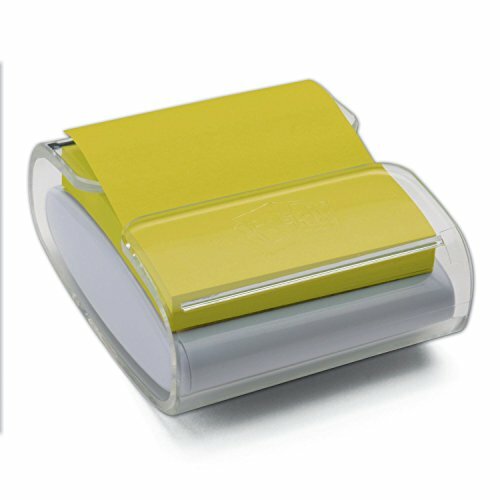 Pop-up note dispenser Yellow 45 sets/pad. 3M touches virtually every part of your life. Yet you re probably only aware of a fraction of those touch-points. With medical dressings that help wounds heal faster, reflective materials that make our roadways safer, and even stethoscopes that listen to Astronauts heartbeats in space, our people and technology make the impossible, possible. Every day we apply our science to make your life better. Mark your pages with these adorable sticky notes. They can be used to bookmark and highlight your coursework, address books, cookbooks, notebooks, etc. Write important footnotes and reminders on them and stick them anywhere. Also great for decorating purposes, these sticky notes can be used by students and for the home office alike. EasyPAG is committed to the office supplies and devoted to create a easy organized and tidy office environment. Post-it Pop-Up Note Dispenser Cat Shape, 3 x 3, White A unique designed pop-up note dispenser, it can help to personalize your workspace. 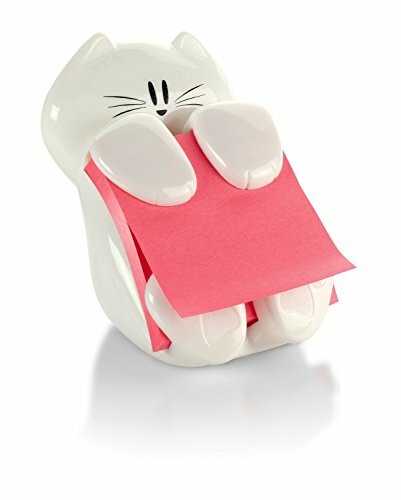 Keep Post-it Notes within reach, with this cute cat-shaped dispenser. 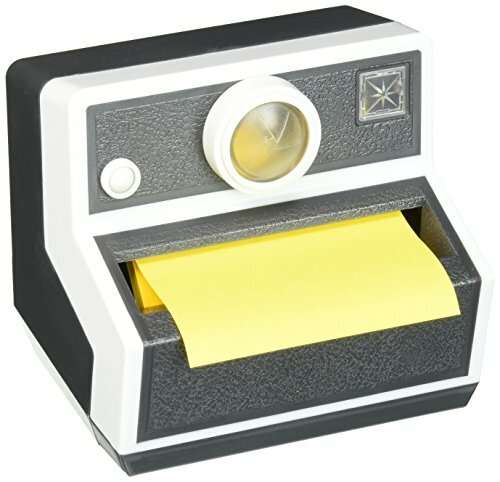 Weighted dispenser allows for one-handed note dispensing. For work, home and school use. A fun way to keep notes at your fingertips. 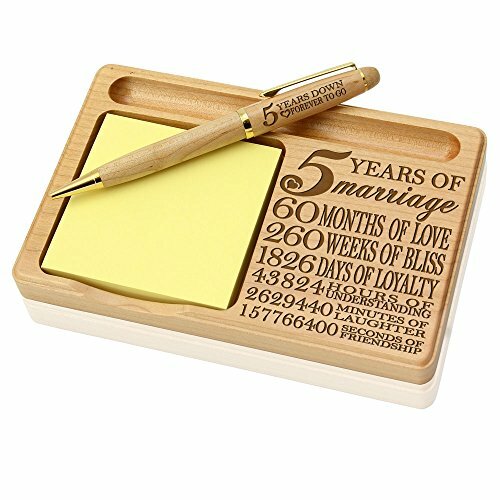 Note Dispenser Type: Pop-up Note Dispenser; Accepts Pad Size W x H: 3" x 3"
Great for a desktop, this charming laser-engraved wooden notepad and pen holder will remind your loved one of your everlasting love and appreciation. Perfect gift for your 5th (fifth wood) wedding anniversary. Packaging: Beautifully packaged in a glossy gift box and fabric bag. Ready to give as gift. -1 Yellow square note pad- 3" x 3"
-5 sticky note index arrow flags- 1 3/4" long x 1/2"
Makes an amazing teachers gift, for friends or students, parents or siblings. For anyone at any occasion! 18 MONTH MONEY-BACK GUARANTEE! Mega Stationers is a brand you can trust! If you are not a 100% satisfied with your purchase we will issue you a full refund- hassle free! 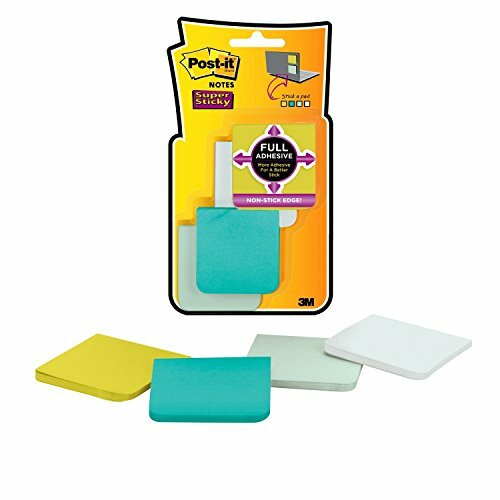 STICKY NOTES MINI BUNDLE!- Pack includes 1 Yellow square note pad, for quickly jotting down important notes or messages. 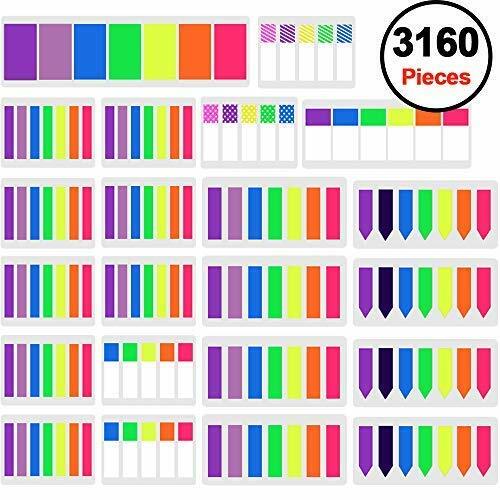 5 pads sticky note index arrow flags in 5 different bright, and vivid colors. Beige box organizer, with 10" ruler included as well! This is a School, Office, and Home necessity. ORGANIZER- A great way to keep your notes organized and in one place. It's neat, and compact and slim- Perfect to carry or to fit in your bag. Keep it on your desk or in your drawer to always have them handy! MEASUREMENTS- Square note pad measures: 3 x 3 inches, Arrow flags measure approx: 1 3/4 long x 1/2. Organizer box measures approx: 5.5 length x 3.4 width x .75 height. Great size, not heavy at all! EXCLUSIVE GIFT!- Makes an amazing teachers gift, for friends or students, parents or siblings. The most convenient to take with you in college. For anyone at any occasion. Great quality, Nice and Stylish design. 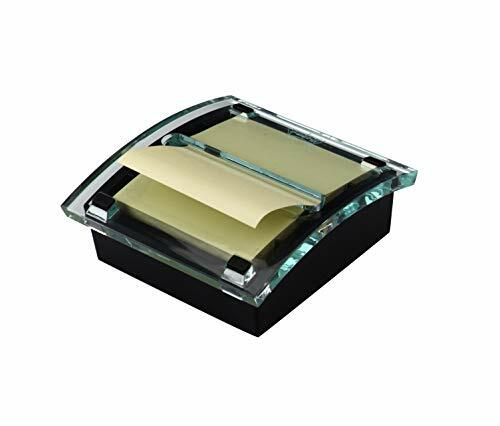 Application: desk organizer, helps personalize your desk area, sleek and professional. Refillable, a great way to keep notes at your fingertips. Size of the edge note holder: 3.9" L x 3.7" W x 1.3" H, can hold over 300 sheets, stacktable for keeping several note colors at hand. 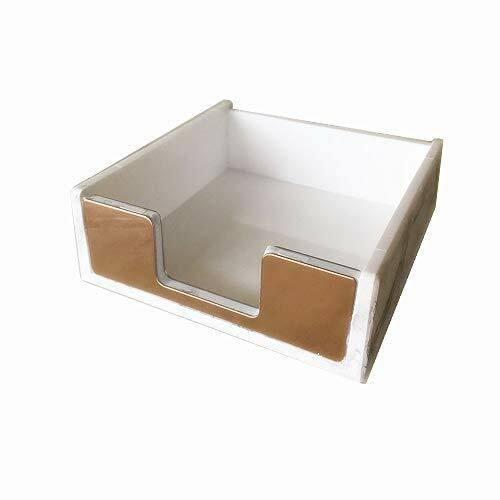 Material: gold steel + high quality ABS in white marble texture, heavy duty, stable on desk, good partner for organizing note pads on top of your desk. Sleek and professional and stylish design, keep your desk neat and organized, make your office beautiful! Size:6 x 6cm / 2.36" x 2.36"
Easy to install. No Tools, No Drilling, No Screw No making holes. Size: 6 x 6cm / 2.36 x 2.36. 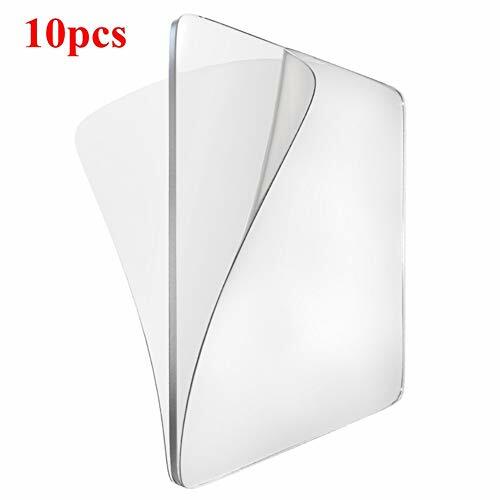 Package including 10pcs gel pads. Waterproof, Oil-proof and high and low-temperature resistance. Works perfectly in kitchen/bathroom. Reusable hook. Can work on smooth ceramic tile or even rough/ little bit pitted ceramic, stainless steel, glass, matte glass, wood, metal ornament, plastic article, etc. Holding up to 15kg. But we\'d like to suggest no more than 10kg for holding a long time. 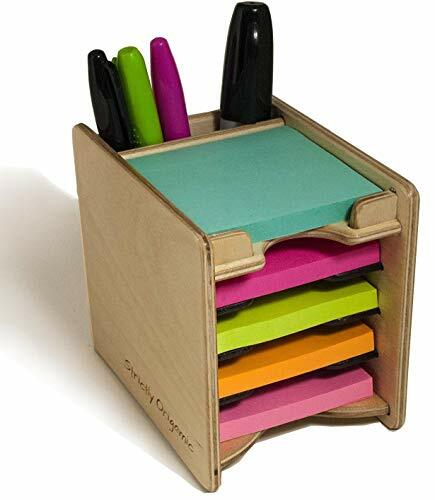 This nicely designed wooden box will help you keep your 3x3 colored sticky notes in one place on your desk or near the places you most often write your notes. PLEASE NOTE: paper is NOT included. A pen/marker holder allows you to always find that otherwise elusive pen that you quickly need to write your notes. Moreover, the upper shelve is designed to keep an active sticky note pad to directly write on. Sturdy and well crafted in birch wood. Measures : Width 3.6" x Depth 5" x Height 4.4". Please check our store for other size or paper options (click on Strictly Origamic link above/below the product title or enter amazon.com/strictlyorigamic in the address bar). Made in USA. Please check our store for other sizes of sticky notes holders (click on Strictly Origamic link above/below the product title or enter amazon.com/strictlyorigamic in the address bar ). Made in USA. Sleek on-trend abstract design fits into any decor - work, home and school use. Multi-functional tool to help them get and stay organized. 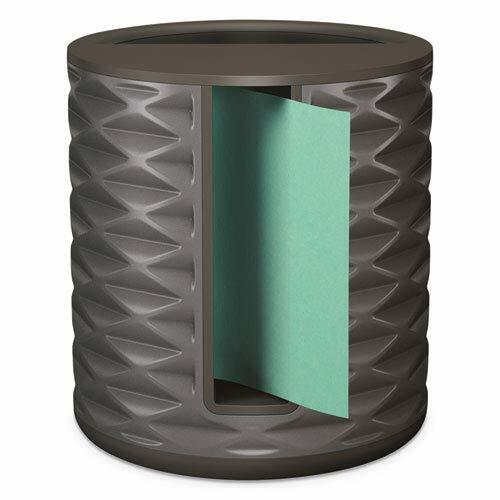 Note Dispenser Type: Pop-Up; Accepts Pad Size (W x H): 3" x 3"; Color(s): Black; Material(s): Plastic. 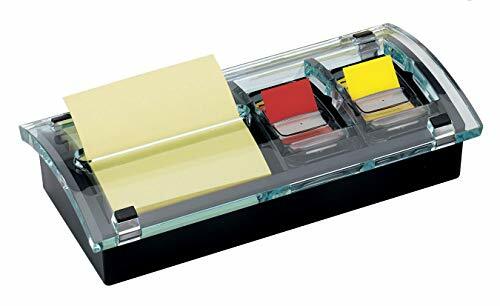 These mini transparent bins are perfect for displaying pens, pencils, colored pencils, and other office supplies right on your desktop. You can even use this small box to display and store business cards. From dry-erase and permanent markers to paint brushes, fountain pens, and sewing tools, these containers are an excellent addition to hold supplies for any workspace. Because this plastic is more durable than glass, these holders are more resistant to breakage. Even if they accidentally slip out of your hands and hit the floor while you carry them, these containers won t easily shatter or splinter. This gives you greater freedom in placement and allows you more versatility in using your space. Plus they can be easily washed with warm water and soap. These containers are safer for use around kids in schools than organizers made of glass or porcelain. These containers measure 4.75 L x 3.75 W x 1.75 H, making them an ideal portable piece for any office or home workspace. These organizers have an elegant yet modern multi-compartment design, with a clear display, allowing them to fit in perfectly with a wide variety of color schemes and design styles. These holders won t clash with or overpower your room, but they can make a statement if you want them to. Each container is lightweight and compact. Display your favorite pens, pencils, or art supplies without the extra bulk of a heavier receptacle. These containers make excellent gifts for any occasion. From house-warming gifts to birthday, Christmas presents, these convenient acrylic containers are sure to be a hit with men, women, and kids everywhere. LIGHTWEIGHT ACRYLIC PLASTIC: Unlike ceramic, glass, or crystal containers, these hard containers are resistant to breakage and shattering. While other materials will chip or shatter when dropped, these extremely lightweight acrylic containers won't easily splinter or break if they happen to slip out of your hands. MULTIPURPOSE CONTAINER: The crystal-clear material of these containers allows them to work well with any decor. Use this small container to organize your free-floating knickknacks, sticky notes, business cards, thumbtacks, and so much more. This small container works for virtually anything, meaning it's great for the home or work office. COMPACT STORAGE: This organizer is compact, allowing you to store and display pens and other small items. Try storing business cards, erasers, or paper clips without taking up too much space on the countertop, table, or desk. With this tasteful, crystal-clear container, you can take charge of your own space, both at home and in a commercial or professional setting. 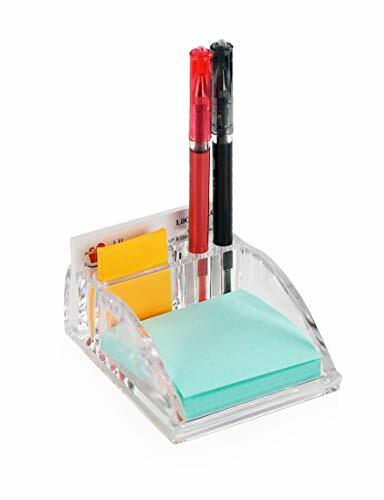 ELEGANT DESIGN: With the minimalist, elegant design of this acrylic small-item-holder, it is easier than ever to display your pens, mechanical pencils, and other office supplies while being tastefully decorative at the same time. Our container has 2 pen holes, a variety of different sized slots, and 1 large front compartment for business cards or sticky notes. GET RID OF CLUTTER: Staples, pens, and paper clips can create a lot of clutter in your home or work office. While desk inserts can be great, they can sometimes be difficult to clean. 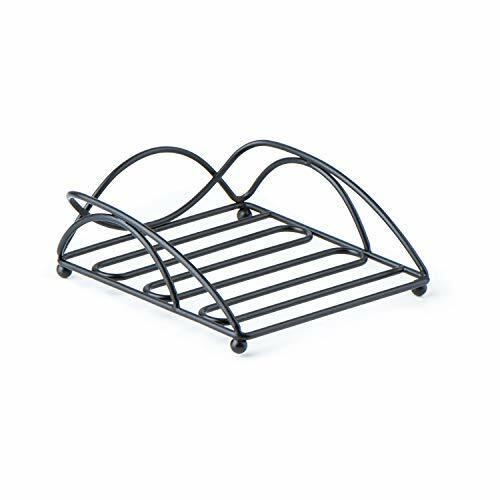 Simply use warm water and soap to wash. With this organizer, you can easily reduce clutter and messes, making home and office organization a breeze. Small notebook with 10 plastic pages (5 sheets) designed to hold sticky notes. 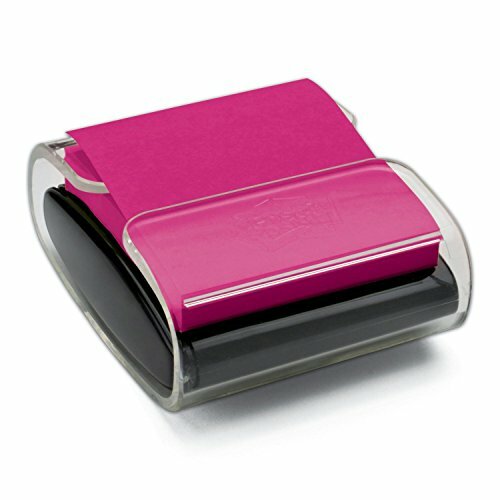 Not just a dispenser, these plastic pages allow you to manage 10 short stacks of sticky notes at the same time, always giving you a surface to write on. Replace and move notes around with ease. Comes with a mini 4" silver pen (black ink) so you always have paper and pen handy to jot down those quick notes when you're on the go. Waterproof plastic pages are sturdy and durable. 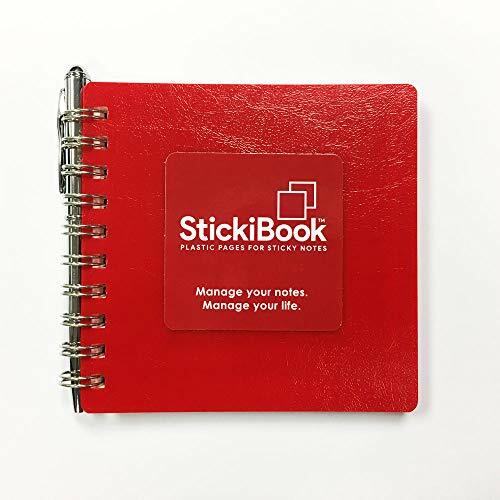 StickiBook is approximately 3.5" x 3.5" and fits standard 3" x 3" sticky notes, or smaller. Comes filled with 30 white self stick notes.